Like most Militaria Dealers I began my career in militaria and arms and armour as a collector. As a boy I would buy, swap and trade to build my collection. My main area of interest has always been WWI and WWII Head-dress. However, as with all collectors over the years you look further and then become interested in other fields. During my early twenties I decided to start up Military Antiques. Living in London the place to open a shop was Camden Passage in Islington. Camden Passage was always a lively cosmopolitan area of London and the markets on Wednesdays and Saturdays drew many collectors in all fields of antiques. 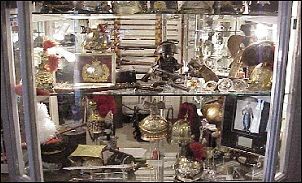 My first shop was in the Mall Antiques Arcade when it opened. I am sure many of you will know me from there and have visited me there over the years. After five years I moved to a larger shop further in the Passage called Phelps Cottage. Here I was able to hold more stock and build up a more comprehensive and wider range of arms, armour and militaria. Again I am sure many of you will have paid us a visit! Unfortunately, due to the area being re-developed I was not able to stay at Phelps cottage and for a short time had another unit in the Mall Antiques Arcade. However, due to my travelling and increased mail order business, I no longer have the unit and now only operate via the website and mail order. I can also be seen and items viewed at the many shows around England at weekends. I attend the two large open air shows in Kent ai??i?? The War & Peace and Odyssey shows. Ai? ?We are also willing to meet customers in person by appointment at a convenient location to them or us. Please contact us. Also if you join our newsletter subscription you will be able to make a note of our forthcoming fairs etc that we are attending for viewing items and latest listings and update times. Over the years I have also built up many customers worldwide by exhibiting at most of the major European and US Shows. These include Reichertshofen and Kassel in Germany and Ciney in Belgium. Also the Show of Shows in Louisville, Kentucky USA. Due to the ever popular internet business and the way people like to shop today, I have now put together this internet site to allow customers to view my stock 24 hours a day and seven days a week. I hope you find something of interest and rest assured that whether you are buying over the net or from us in person we will endeavour to give a first rate service. We endeavour to get orders out as quickly as possible to our collectors and currently have good and safe postal services to rely on. We look forward to meeting old and new customers and hope you enjoy the site and find it easy to use.